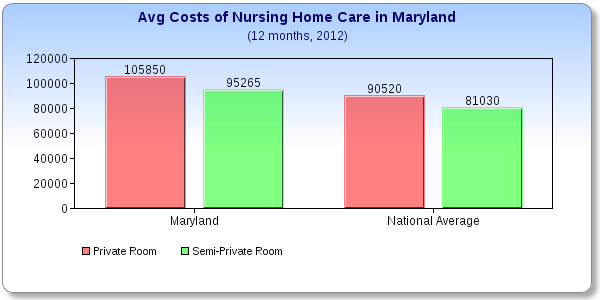 What does a Nursing Home Cost in Maryland? 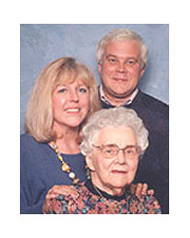 Are you considering nursing home care for someone you love? The Price Depends on Where You Live in Maryland. In Baltimore for example, the average cost of a semi-private room was $279 per day. In Silver Spring it was $276, and in the rest of the state, it was $244 daily. The rates in our chart reflect average costs. There were many facilities that charged more or less than the average. A semi-private room in the state ranged from a low of $190 to a high of $334. That's a spread, for a year's cost, of $69,350 to $121,910. The 2012 average was a $31 more than the 2011 average of $248 per day for a semi-private room. Maryland was the 12th most expensive state for nursing home care. Maryland ranked 12th for the cost of a nursing home room in the United States, according to this survey. Pennsylvania ranked just above, and Vermont just under. The United States average cost for a semi-private room was was $222 per day. A private room was $248. Data was compiled using hourly/daily cost averages as published in the MetLife Mature Market Institute Market Survey of Long-Term Care Costs. This survey information came from the MetLife Mature Market Institute. The full report is available at the Institute's website. Our Home page for this site.